Kettering Town's Evo-Stik South League Premier clash with Tiverton Town tonight (Tuesday) has been called off. An inspection of the Latimer Park pitch was carried out this morning but the surface remains waterlogged following the rain at the weekend and yesterday. The Poppies are due to be back in action at Stratford Town at the weekend. Corby Town's clash at Cleethorpes Town in the Evo-Stik League South has also been postponed following a pitch inspection this afternoon. The Steelmen will now hope to return to action when they play Gresley FC at Steel Park on Saturday. 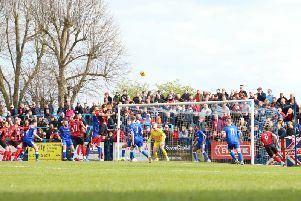 Table-topping AFC Rushden & Diamonds moved a step closer to promotion in the Evo-Stik South League East with a 2-0 success at Barton Rovers at the weekend. But they will now have to wait until Saturday to continue their push for honours after this evening's home game with AFC Dunstable was postponed due to a waterlogged pitch at Hayden Road. Diamonds entertain Aylesbury this weekend in a game the club have made a 'Pay What You Want' fixture.